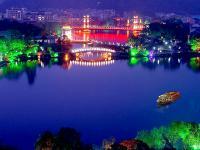 Guilin has very active nightlife and entertainment activities. In Guilin, you can always find ideal ways to enjoy your nightlife here. 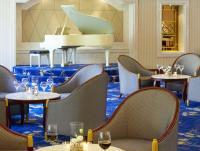 The followings are some recommendations offered by our Guilinholiday. In the downtown of Guilin, water occupies big area. Guilin is regarded as a famous water city in China. The Evening Cruise on the "Two Rivers & Four Lakes" water system is a must to enjoy Guilin nightlife. The great waterway refers to Li River, Peach Blossoms River, Banyan Lake, Fir Lake, Osmanthus Lake and Mulong Lake that are connected and liked up. Every night, when it’s getting dark, all the colorful lights prepared on the waterside and on the hills are turned on. They make the city of Guilin more colorful and dreamlike. Tourists can choose to walk along the lakes or take the local electric boat to have a one-hour cruise on the four lakes. Featuring the colorful ethnic culture of the Guilin region, various night shows are staged every night in theaters or hotels. For example, at Royal Garden Hotel, it offers Guiju Opera like Impression Liusanjie Dragon Nationality Show; Guilin Theaters (12 Binjiang Lu, Guilin), which is the venue for the nightly Longji show at 8.00pm. The one-hour performances have a unique style which is rarely seen elsewhere in China; Guilin Dreamland Theater (95 Qixing Lu, Guilin), the venue for the nightly Dreamland Li River drama, is a fairy tale of the creation of Guilin, while the performance begins at 7.00 pm every night. If you want to enjoy leisure time, many dance clubs, coffee shops, and pubs are open late into the night. You'll have places to go all the night. Most of the night clubs and bars are found on the Zhengyang Walking Street close to the central square. Places such as Camel Bar at Sheraton Hotel Guilin, Baidu Recreation Arlun Story Saloon, Fucheng KTV Guilin Grand Kara Okay, Wanghu Pavilion Tea Art Cafe Yiren Saloon, Left Bank Café and so on will be brilliant for nightlife funs.